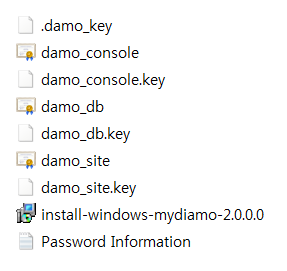 From MyDiamo version 2.0.0.0, the installation method has been changed. # If you have versions under 1.6.1.0, please contact mydiamo@pentasecurity.com for installation guide. # If you have versions higher than 2.0.0.0, move on. Before installing MyDiamo, you must first check the below. The process of downloading MyDiamo package and checking the prerequisites above will be proceeded in the following. First, check the [MyDiamo Supported Platforms]. After checking supported platforms, please move on. Now, download the MyDiamo package at the download page. By the downloading process, you can get MDFL ID, Auth code, installation file, and key pairs, all through E-mail. Please check if your MySQL/MariaDB version is supported by the specific MyDiamo version. You can check this information on the download page. 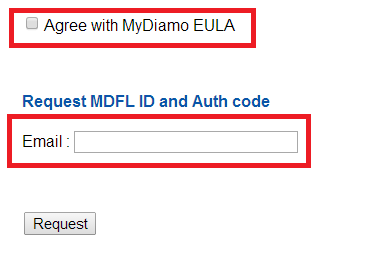 After applying, you can acquire MDFL ID and Auth code through E-mail. Here is an example of ID and Auth code. MyDiamo key pairs, installation file and password information would be provided through link in E-mail (MyDiamo_Package file). You must first extract the file. Please check if the files and password information are like the followings. In MDFL e-mail, there is a link which you could download MyDiamo installation file, key files and password information (MyDiamo_Package file). Unzip the .tar.gz or .zip file and transfer the folder to the DB server where MyDiamo will be installed. damo_site.key The public key pair of the site consists of the public key (certificate) and the private key, which is encrypted. The key pair is created only once in each Site, and it is used to create the Console public key pair and DB public key pair. It is also used for resetting the password when the DB KEY password is lost. The key pair is created by the DB security administrator of the client; for security reasons, and it is quite important that it is kept safely by the security administrator. damo_console.key The public key pair of the Console consists of the public key (certificate) and the private key, which is encrypted. The key pair is created only once in each Site, and it is used to authenticate the D'Amo Console. The Console public key is also referred to as a certificate. 1. If the same files are already saved in the chosen directory of the key pair files, the system will back up these files with a creation date as its extension. 2. Do not lose the password information for key files. You will be unable to decrypt or restore encrypted data.